Get ready for exciting stunt and story action with play sets inspired by Disney Pixar Cars 3! Each playset features iconic details, epic launchers, side by side racing and single lane stunt jumping! Choose from a variety of key settings like Crazy 8, Fireball Beach and Smokey's. Each set has themed accessories and includes an all-new movie vehicle to start the play right away. Recreate movie scenes and then transform the sets into other configurations for more thrilling ways to play! You can also extend the world of Cars racing fun by connecting these sets to other Story Sets! 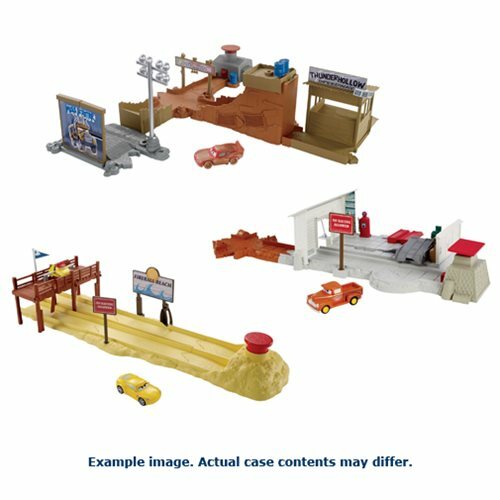 The Cars Story Sets Playset Assortment Case Contains 4 individually packaged playsets.